1905: The Huskers win in the mud against Knox, 16-0. C.L. Morse had a 55-yard touchdown run for Nebraska. 1920: George Gipp and Notre Dame down the Huskers in Lincoln, 16-7. 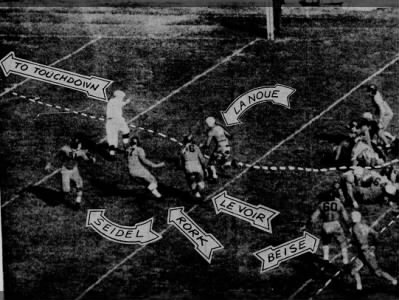 Notre Dame's first touchdown might have come on fifth down. 1925: A blocked extra point preserves a 6-6 tie with Washington, a team that would end up in the Rose Bowl. 1960: The Huskers manage just five first downs against Army, but big plays by Pat Fischer help Nebraska to a 14-9 win in Lincoln. 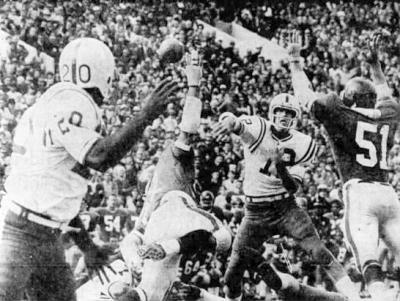 1965: Nebraska has no trouble with Kansas State, rolling to a 41-0 win in Manhattan for the Huskers' third consecutive shutout. «1970: After Kansas reels off 20 consecutive points in the first half, Nebraska rallies for a 41-20 win in Lawrence. It was the first start of the '70 season for quarterback Van Brownson (pictured). 1975: The Husker offense repeatedly bogs down near the end zone but the Blackshirts shine in a 16-0 victory over Kansas. 1980: Nebraska crushes Kansas in Lawrence, 54-0, as reserve I-back Craig Johnson enjoys another big game against the Jayhawks. 1985: The Blackshirts shut down the running game of fifth-ranked Oklahoma State in a 34-24 win in Stillwater. 1990: Quarterback Mickey Joseph stars as Nebraska rolls to a 69-21 victory over Missouri. 2000: Nebraska shoots down Texas Tech's potent air game in a 56-3 drubbing in Lubbock. 2005: The Huskers use a strong running game in the second half to subdue Baylor, 23-14. 2010: The favored Huskers drop a much-hyped game to Texas, 20-13.